New POS device capabilities can benefit grocery store technology by reducing lines and improving the customer experience. High-resolution cameras, powerful processors and new apps can now enable virtually any phone to be converted into a POS device. Bringing this functionality to associates or consumers can help reduce lines while increasing customer convenience and satisfaction. Some grocers are already rolling out “scan and pay” options that allow consumers to use their own phones, while others are deploying mobile phones to associates to expedite checkout in departments and during peak periods. Grocery shoppers are eager to adopt new technologies to meet their need for speed and convenience. A survey by the National Grocers Association reported that nearly half of respondents said fast checkout was “very important.” Nielsen reported in the Future of Grocery that more than 20 percent of shoppers currently use self-checkout while 65 percent said they are willing to do so in the future. Additionally, 70 percent of respondents also said they were willing to use a hand-held store scanner to purchase products as they shop, to avoid checkout lines. “As we’ve seen with self-checkout, one of the more mature flexible retailing options included in the survey, as more retailers incorporate these options into their in-store and online offerings, adoption rates will likely increase,” said Patrick Dodd, president, global retailer vertical at Nielsen. Beyond self-checkout capabilities, mobile POS devices could offer those same capabilities anywhere in the store. Grocery stores could deploy these in perimeter departments such as bakeries or flower departments where there is a higher level of customer service, says John Gibson, senior manager retail, business development at Samsung. “A lot of times, people come in and that’s all they’re getting. They’re running in and there’s a touch point similar to an old-fashioned grocery store. It could be a good opportunity for a queue busting solution in those areas,” Gibson says. 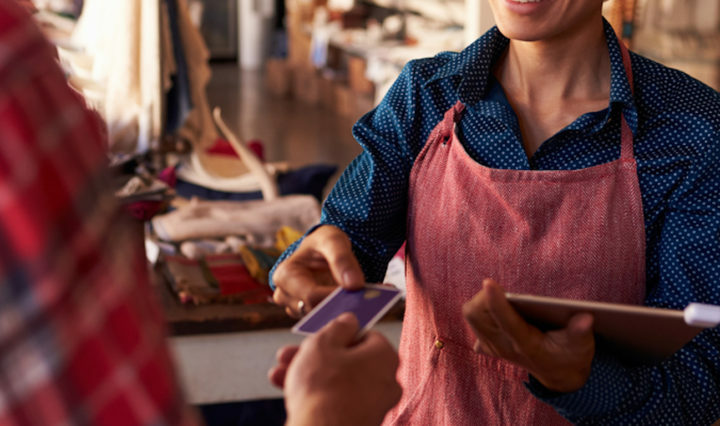 With the current landscape, grocery stores are seeing more potential for mobile POS in the hands of consumers, developing apps for a speedier checkout and a streamlined customer experience. For the most effective application, it should include an easy-to-use barcode scanner and a secure EMV payment connection. At Sam’s Club, their app’s Scan and Go function allows the shopper to scan and pay for their own groceries and merchandise. The app uses the phone’s camera as a barcode reader, then tallies all products and offers a one-click payment through a debit or credit card linked to the account. The system enables the customer to check themselves out wherever they are, skip any lines and simply show a digital receipt to an associate on the way out of the store. MarketWatch reports Kroger is also rolling out its “Scan, Bag, Go” technology at 400 stores next year, which will also enable customers to scan and pay for items through an app. Gibson says these technologies can offer great potential to reduce lines by eliminating the “arduous individual line item scanning process” at designated locations. In addition to queue busting, these consumer-facing apps also have the potential to increase personalization. By analyzing purchasing data, apps can display specific storewide promotions or discounts based on a shopper’s buying history. Stores could also add features to store digital coupons, or help with store navigation. Overall, this will help consumers turn their phone into an all-in-one resource for their grocery experience. “I think the future is more of a bring-your-own-device environment. Phones are becoming sort of the new wallet. And whether it’s being used as a scanning or self-service device or as a payment device, it will be the future of grocery,” Gibson says.